On Earth, as on Titan (the largest moon of Saturn), it is still impossible to accurately determine atmospheric flows directly from the shape and orientation of the dunes. The laws of transport, wind and properties of the granular medium being nonlinearly linked, this exercise is an inverse problem of a great complexity that should be solved collectively. To bring new constraints to the climate of Titan we propose to analyze the dynamics of Titan’s dunes with a new approach coupling satellite observations to experimental and numerical calculations. Depending on their size and their environment, dunes integrate the (long or short) history of the flows that shaped them. The orientation and shape of the different dunes we propose to study will therefore allow us to explore a wide range of time scales and to understand in the framework of an original approach a wide variety of physical processes involved in mechanisms of sediment transport (e.g. cohesion, the role of topography). The tools used wil be the meteorological and morphological data acquisition in the field, satellite observations, laboratory experiments and numerical models. By pooling these four types of approach we aim to develop new methods of inversions to determine more efficiently the past/present climatic conditions under which Titan’s dunes were formed. On Earth, such as Mars and Titan, the average wind speed reaches its maximum at the polar regions and ice crystals or even snow can act as a granular. 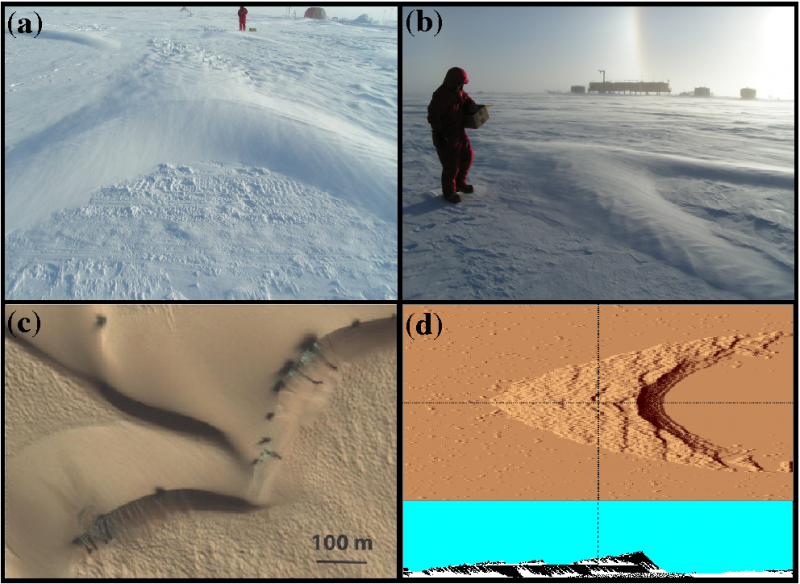 Therefore, the dunes are frequently observed and the polar ice caps are a new frontier for communities that explore, through the dune morphodynamics and with the help of comparative planetology, climatic conditions under which they were produced. Indeed, even if intrinsically physical transport is the same, it is obvious that the hot and cold desert dunes will be primarily shaped by the particular nature of the mechanisms emerging from the environment. In the case of cold dunes on Earth, it will typically imply bedform fusion and solidication mechanisms. On Mars and Titan, it could be respectively the sublimation of CO2 in the subsurface layers (Mars) or cohesion related to organic material that composes them (Titan). (a, b) cold barchan at the european drilling site Kohnen in Antartica. These dunes are formed during storms (> 10 m/s at h = 2 m) and are preserved in ice (Birnbaum, G., et al., Journal of Glaciology, 56, 2010). They have a height of about 20 cm for an aspect ratio of less than 0.1. Their density is higher than that of the surrounding ice. (c) “Dark spots” on dunes at the north pole of Mars, supposed to be associated with ice sublimation porcesses (Hansem et al., Science, 331, 2011). (d) Stratification and segregation in barchans in the numerical model of the IPGP. 3D sedimentary structures can be injected into the subsurface, as well as processes which certainly play a very important role on Earth, Mars (ie sublimation) and Titan (ie cohesion). 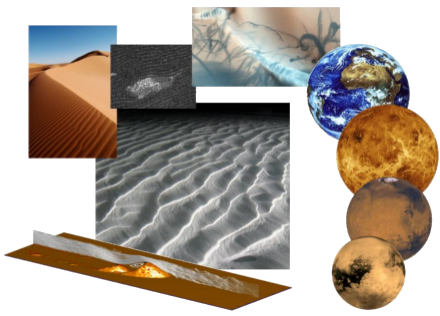 By combining the skills regarding the analysis of observations of planetary surfaces and atmospheres (AIM laboratory) with skills developed within IPGP regarding numerical modelling of complex geophysical systems, the project aims to analyze the dynamics of sedimentary bedforms on Titan. 1. Deserts: Growth and stability of star dunes under the effect of multidirectional flows. Towards a better understanding of the orientation modes of dune crests. Star dunes are giant dunes whose ramifications extend in many directions. From numerical models taking into account the multidirectional wind regimes, researchers from the Institut de Physique du Globe de Paris (IPGP-CNRS) and the Laboratory of Matter and Complex Systems (CNRS-MSC) have shown that star dunes could be considered as a superposition of longitudinal dunes. The direction and the rate of growth of each branch can then be predicted as a function of the configuration of the flow and the quantity of sand available. These new results open new perspectives for the analysis of dune fields and sediment transport in many geophysical environments subjected to multidirectional flows. Star dunes can be described as a tangle of dune forms whose crests and sides of avalanche spread in multiple directions. They usually consist of a central dome which grows on smaller structures with apparently no preferred orientation. Probably because these star dunes are very large (more than 100 m high) and apparently highly complex, their shapes and dynamics have been, until now, very few studied. The majority of these studies rely on secondary flows which, depending on the topography, create recirculation currents in directions oblique to the main flow. These flows are the cause of the growth of arms and would control the final shape of the dunes. The new findings go against this hypothesis and clearly show that star dunes can be produced from the sediment transport associated with each of the main directions of flow. This work also shows that the ramifications of star dunes have morphological characteristics (height, width) and growth (velocity) depending on the wind conditions. For reasons of symmetry, there exists some regimes more favorable than others for the growth of branches. Another control parameter is the frequency with which the winds change direction. As the frequency decreases, the characteristic dimensions of the ramifications increase and their propagation velocities decrease. These results are important because they are applicable to all types of dunes and connect for the first time the dune forms to flow variability. Therefore dunes complex geometries could be analyzed to help understand indirectly variability of the wind direction. This has many advantages in environments where extra-terrestrial dunes proliferate and in which it is not possible to directly measure atmospheric flows, like on Titan. Figure: Star dune obtained by a real-space cellular automaton dedicated to sediment transport. This morphology is obtained by the successive action of winds blowing in 5 different directions. The angle between each wind is the same such that the resultant is zero. Note the shift between the orientation of ridges on the central dome and the orientation of ramifications spreading on the non-erodible table. These two orientations are representative of the two modes of dune development in the presence of multidirectional flows. Reference : Morphology and dynamics of star dunes from numerical modelling, Zhang D., Narteau C., Rozier O. & Courrech du Pont S., Nature Geoscience, 5, Published online: 24 June 2012 | doi:10.1038/ngeo1503. 1. 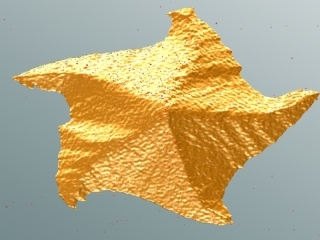 Morphology and dynamics of star dunes from numerical modelling, Zhang D., Narteau C., Rozier O. & Courrech du Pont S., Nature Geoscience, 5, Published online: 24 June 2012 | doi:10.1038/ngeo1503. 1. Singular regional brightening events on Titan as seen by Cassini/VIMS, S. Rodriguez, S. Le Mouélic, J.W. Barnes, M. Hirtzig, P. Rannou, C. Sotin, R.H. Brown, J. Bow, G. Vixie, T. Cornet, O. Bourgeois, C. Narteau, S. Courrech du Pont, C.A. Griffith, R. Jaumann, K. Stephan, B.J. Buratti, R.N. Clark, K.H. Baines, P.D. Nicholson, A. Coustenis, 43rd Lunar and Planetary Science Conference, Houston, March 2012. 2. Morphodynamics of star dunes, Zhang D., Narteau C., Rozier O., Courrech du Pont S., EGU, Geophysical Research Abstracts, abstract No. 3546, Vienna, April 2012. 3. A Real Space Cellular Automaton Laboratory (ReSCAL) to analyze complex geophysical systems, Rozier O., Narteau C, EGU, Geophysical Research Abstracts, abstract No. 5890, Vienna, April 2012. 4. [invited] Tropical storms (?) on Titan as seen by Cassini/VIMS, S.Rodriguez, “Titan workshop”, Nantes, May 2012. 5. L’atmosphère et le climat de Titan surveillés par l’imageur hyperspectral VIMS de la sonde Cassini, S. Rodriguez, S. Le Mouélic, J.W. Barnes, M. Hirtzig, P. Rannou, C. Sotin, R.H. Brown, J. Bow, G. Vixie, T. Cornet, O. Bourgeois, C. Narteau, S. Courrech du Pont, A. Coustenis, Colloque annuel de la Société Française de Télédétection Hyperspectrale, Toulouse, June 2012. 6. Equinoctial atmospheric activity over Titan dune fields revealed by Cassini/VIMS, . Rodriguez, S. Le Mouélic, J.W. Barnes, M. Hirtzig, P. Rannou, C. Sotin, R.H. Brown, J. Bow, G. Vixie, T. Cornet, O. Bourgeois, C. Narteau, S. Courrech du Pont, C.A. Griffith, R. Jaumann, K. Stephan, B.J. Buratti, R.N. Clark, K.H. Baines, P.D. Nicholson, A. Coustenis,3rd International Planetary Dunes Workshop, Flagstaff, June 2012. 7. Morphodynamics of star dunes, Zhang D., Narteau C., Rozier O., Courrech du Pont S., IUGG conference on Mathematical Geophysics, Edinburgh, July 2012. 8. [invited] Equinoctial activity over Titan dune fields revealed by Cassini/VIMS, . Rodriguez, S. Le Mouélic, J.W. Barnes, M. Hirtzig, P. Rannou, C. Sotin, R.H. Brown, J. Bow, G. Vixie, T. Cornet, O. Bourgeois, C. Narteau, S. Courrech du Pont, C.A. Griffith, R. Jaumann, K. Stephan, B.J. Buratti, R.N. Clark, K.H. Baines, P.D. Nicholson, A. Coustenis, International methane workshop, Dole, November 2012. 9. Morphology and dynamics of star dunes from numerical modeling, Zhang D., Narteau C., Rozier O., Courrech du Pont S., AGU fall meeting, San Francisco, December 2012. 10. Equinoctial activity over Titan dune fields revealed by Cassini/VIMS, . Rodriguez, S. Le Mouélic, J.W. Barnes, M. Hirtzig, P. Rannou, C. Sotin, R.H. Brown, J. Bow, G. Vixie, T. Cornet, O. Bourgeois, C. Narteau, S. Courrech du Pont, C.A. Griffith, R. Jaumann, K. Stephan, B.J. Buratti, R.N. Clark, K.H. Baines, P.D. Nicholson, A. Coustenis, AGU fall meeting, San Francisco, December 2012.